How Does WebFOCUS Graphics Use the Virtual Coordinate System? Whether you save your graphs in SVG or PNG format, you will plot them on a Cartesian grid using the Virtual Coordinate System. The Virtual Coordinate System provides a way to position and size graph elements relative to the area in which the graph is displayed. Changing the aspect ratio (ratio of width to height) of the area results in the necessary adjustments to the graph elements, creating a graph that fits properly in the space allotted for it. This feature has many benefits, including the ability to set font size with virtual coordinates, ensuring that text appears proportionate regardless of the size of a graph. The Virtual Coordinate System provides data visualization in WebFOCUS applications widely distributed on the web to users with different display technologies and output devices. This topic takes a look at the basics of coordinate systems to help you understand how you will create WebFOCUS graphs. The Cartesian Coordinate System consists of two number lines perpendicular to each other. Called axes, the horizontal number line is the X-axis and the vertical number line is the Y-axis. The axes form a plane (typically, a flat surface). With the Cartesian Coordinate System, you assign a pair of numbers, designated as (X,Y), to identify a point on the plane. The first number is the X-coordinate and the second number is the Y-coordinate; together, the numbers are the coordinates of the point. The coordinate point at which the two axes intersect is the origin (0,0). The following diagram plots a point on a plane. The Cartesian coordinates of the point are (2,3). Starting at the origin (0,0), the first number represents 2 units to the right of the origin on the X-axis, and the second number represents 3 units up on the Y-axis. Tip: The two Cartesian axes divide a plane into four quarters, called quadrants. For simplicity, the diagrams show only one quadrant. If we double the width of the grid—that is, change its aspect ratio (the ratio of width to height)—the number of coordinate points on the X-axis increases to 10. The space between coordinate points remains the same; the space between coordinate point 0 and coordinate point 1 (or between 1 and 2, 2 and 3, and so on) does not change between grids. As a result, when we plot (2,3) on the wider grid, the 2 units to the right of the origin are the same width as before, and the shaded area is unchanged. In fact, it will always be rendered exactly the same regardless of the size and shape of the grid. The Virtual Coordinate System used by WebFOCUS Graphics is based on a Cartesian grid. As shown before, the first diagram plots a point with Cartesian coordinates (2,3) on a Cartesian grid. This time, however, when we double the width of the grid (second diagram), the number of coordinate points on the X-axis remains 5, and, consequently, the space between coordinate points increases. In the Virtual Coordinate System, the number of coordinate points on both axes is constant regardless of the size of the grid. As a result, when we plot (2,3) on the wider "virtual" grid, the 2 units to the right of the origin are doubled in width from before. The Virtual Coordinate System, illustrated in the second diagram, results in the proportionate display of the shaded area in the increased width of the grid; it is stretched horizontally. The width of the shaded area will always change relative to the width of the grid. The following graphs are generated by a WebFOCUS procedure. The specific API calls that created these graphs are described in later sections of this manual. This example illustrates the results you can achieve using virtual coordinates to control font size. The font size changes relative to the designated size of the area in which the graph is displayed (the graph output area). Absolute coordinates control the font size for the X-axis and Y-axis labels. Virtual coordinates control the font size for the legend. The width and height of the graph output area are controlled by two WebFOCUS graph commands. Next we modify the procedure to increase the size of the graph output area. The font size for the axis labels—specified with absolute coordinates— remains the same, and the text is now proportionately too small and harder to read than before. An absolute size, whether it is the size of a font or another graph element, always renders exactly the same whether the graph is large or small. The font size for the legend—specified with virtual coordinates—increases proportionately with the size of the graph and the text is still easy to read. In this example, the size of the vertical bars (risers) is also controlled with virtual coordinates. Like the size of the legend text, they increase proportionately when the graph output area is increased. Applet Rectangle—Defines the graph output area, which is the entire area allowed for the presentation of a graph. The Applet Rectangle sets the size and shape of the virtual coordinate grid used for plotting a WebFOCUS graph. Frame Rectangle—Is the area within which the graph coordinates are plotted. Legend Rectangle—Explains how to interpret the data plotted on a graph. To plot a point in the Cartesian Coordinate System, you must provide at least two coordinates (X,Y). 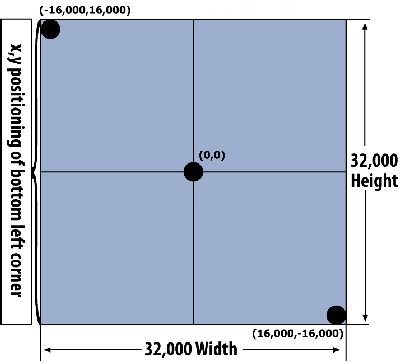 In WebFOCUS Graphics, four coordinates are required to plot a rectangle such as the Frame Rectangle or Legend Rectangle—X, Y, Width, and Height. The first two coordinates (X,Y) control the point location of the bottom left corner of the rectangle, while the last two coordinates control the width and height of the rectangle. Two absolute values set the size and shape of the Applet Rectangle. The following is a Cartesian grid showing the total number of X-axis and Y-axis coordinate points used to plot a WebFOCUS graph. It is represented as a square, with points plotted in the Cartesian Coordinate System. Coordinate point (0,0) is the center of the grid. If we superimpose this grid over a WebFOCUS graph (next diagram), its shape changes from a square to a rectangle (the Applet Rectangle), a shape typically used in the presentation of a graph. However, the number of points on both the X-axis and Y-axis remains 32,000. The fact that the number of points is constant regardless of the size or shape of the grid is the reason why the coordinate system used by WebFOCUS Graphics is called the Virtual Coordinate System. The values passed on a WebFOCUS Graphics API call to position and size graph elements do not apply to pixels; rather, they are conceptual points on a conceptual grid. The examples that follow always show the position of coordinate point (0,0) to mark the center of the grid used in the Virtual Coordinate System. It will help you see the effect of the changes made to the sample graphs. The position of coordinate point (0,0) on the grid is constant, and graph elements such as rectangles move relative to it through the arguments passed on a WebFOCUS API call. In these examples, WebFOCUS Graphics uses the default values for the Applet Rectangle. You plot an Applet Rectangle with the WebFOCUS HAXIS setting (width of graph output area) and VAXIS setting (height of graph output area) in a procedure. In general, the optimal display format for an Applet Rectangle is 1.618 units in width for every 1 unit in height. This aspect ratio is essentially a golden rectangle, a form used since ancient Greece in art and architecture. It is naturally pleasing to the human eye. The Frame Rectangle does not include the wall or floor of a graph rendered with a three-dimensional effect for depth, as shown in the following diagram. This is important to keep in mind when you position and size the Frame Rectangle.